You are currently browsing the tag archive for the ‘John the Baptist’ tag. The First Baby Shower: Rejoicing, Liberation and Celebration! 39-45Mary didn’t waste a minute. She got up and traveled to a town in Judah in the hill country, straight to Zachariah’s house, and greeted Elizabeth. 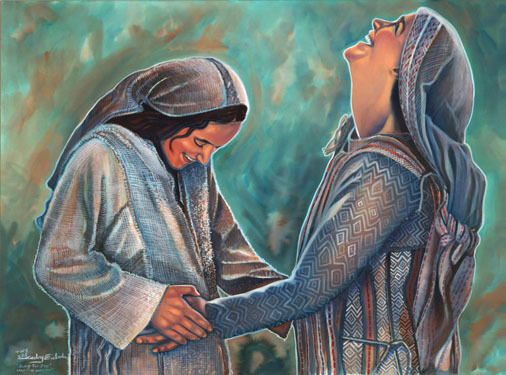 When Elizabeth heard Mary’s greeting, the baby in her womb leaped. She was filled with the Holy Spirit, and sang out exuberantly,You’re so blessed among women,and the babe in your womb, also blessed, And why am I so blessed thatthe mother of my Lord visits me? The moment the sound of your greeting entered my ears,The babe in my wombskipped like a lamb for sheer joy.Blessed woman, who believed what God said, believed every word would come true!46-55And Mary said, I’m bursting with God-news;I’m dancing the song of my Savior God.God took one good look at me, and look what happened—I’m the most fortunate woman on earth!What God has done for me will never be forgotten, the God whose very name is holy, set apart from all others. His mercy flows in wave after wave on those who are in awe before him. He bared his arm and showed his strength, scattered the bluffing braggarts.He knocked tyrants off their high horses,pulled victims out of the mud. The starving poor sat down to a banquet; the callous rich were left out in the cold. He embraced his chosen child, Israel; he remembered and piled on the mercies, piled them high. It’s exactly what he promised, beginning with Abraham and right up to now. 56Mary stayed with Elizabeth for three months and then went back to her own home. I playfully call the account of Mary’s visit to Elizabeth the first baby shower. In America baby showers are times for women to come together and celebrate new life; presents are exchanged, advice given and games played. I am sure that each culture has its own version of the baby shower. 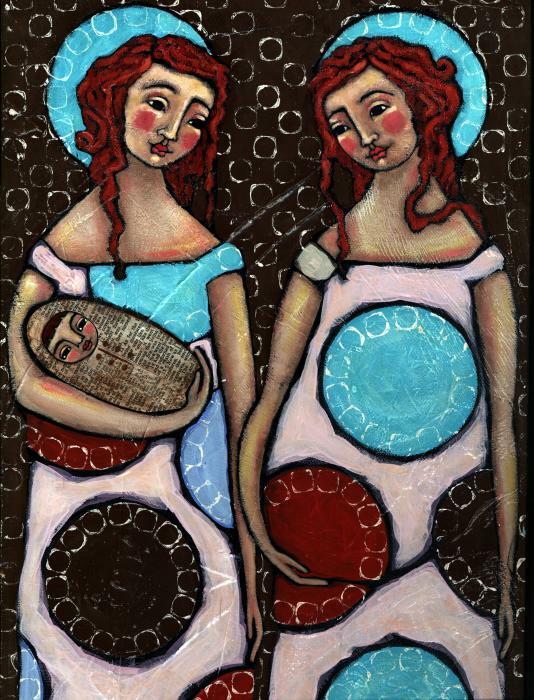 Mary and Elizabeth celebrated the new life within them by exchanging presents of joy, encouragement, song and prophecy. Both women were carrying children of promise: one would pave the way and the other would be the way. John the Baptist being a prophet even from the womb jumped for joy because he knew the baby Mary carried was the Messiah. Mary and Elizabeth were both silenced and marginalized in their society, yet in the company of each other they declared prophetic words of what God was doing in their midst. Neither woman had a convenient pregnancy- Mary being a teenager and Elizabeth being an elderly woman, but each allowed herself to be inconvenienced for God’s purposes. 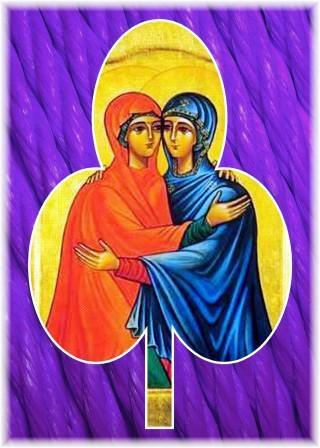 Mary and Elizabeth’s celebration shows the importance of women coming together for prayer, praise and prophecy. When Mary sings: “He knocked tyrants off their high horses, pulled victims out of the mud. The starving poor sat down to a banquet; the callous rich were left out in the cold” we see that in the presence of Elizabeth she could freely declare words that may have been dangerous if spoken in public. When women gather in Christ name he is in our midst. Mary and Elizabeth are a positive example of what can happen when women come together to celebrate life. By their example I am reminded of women coming together throughout history such as: Ruth and Naomi, woman suffragists, and the Fourth World Council on Women in Beijing, China. As we reflect during this season of Advent we must remember that the Gospels included everyday people who God used in extraordinary ways and that we can walk in their example. Women can continue to come together to rejoice, celebrate and prophesy about liberation through collective action and prayer. When we come together the course of history will be interrupted, life birthed and hope given. Question for Reflection: Using the example of Mary and Elizabeth how can women support each other and create a space that celebrates life? Prayer: Dear God give us spaces to rejoice, laugh, and celebrate your life during this Christmas season. Develop friendships that will inspire us to speak truth to power. Help us to support our sisters and rejoice with those who rejoice. Thank you for the example of Mary and Elizabeth. Thank you for the gift of your life. In Jesus name we pray. Amen.